Need some bubbles to perform on cue? Contact Casey, he'll know what to do. Who does one of the world’s premier entertainment companies come to for bubble advice? Casey Carle of course. As bubble consultant Mr. Carle helped design the one-of-a-kind set and specialized props and equipment used in the Las Vegas production of "LOVE". In 2005/2006 he coached and trained original members of the elite cast in manipulating soap bubbles with stunning results. He returns periodically to coach new cast members and to update technical aspects during the production's minimum 10 year run at The Mirage Hotel. "Casey’s expertise has been of great value to the show. He is a skilled teacher and true master of his craft. His professional approach was appreciated by everyone and he had a great rapport with the cast and crew. His dedication motivated the performers and his jovial personality made the workshops light and fun. It was a pleasure to work with Casey and I would certainly recommend him as a consultant." Called on by the Director of Engineering at Fisher-Price, Casey presented his unique skills to their team of engineers and toy designers in order to expand their understanding of soap bubbles from a scientific perspective. The result: an overwhelming appreciation for, and reinforcement of the importance of imagination and "outside the box" thinking that come with developing unique and engaging forms of entertainment, whether it be live performance or toy development. "This was just the kind of 'brain juice' we need to keep our creativity alive and kicking! What a great show he put on -- funny, smart, clever, innovative and at the same time educational and truly applicable for toy design and development! It was one of the best 'moments of inspiration' I've seen here at FP and well worth every minute to observe his talents and expertise -- and it was just plain fun! Priceless!" Pepsi called on Casey Carle for the filming of their amusement park commercial shot at Coney Island, NY. Their vision was to provide multiple large bubbles high in the air to choreographed music and on cue during an active sidewalk scene. Not only a consultant on this shoot, Casey can be seen in the commercial in the role of amusement park bubble vendor/performer. Scheduled for national broadcast 2006-2007. "Thanks so much for being part of our Pepsi shoot. Your Bubble expertise was well worth (the investment)"
Known globally for their mission to combine beauty products with social consciousness, Aveda was celebrating a 30 Year Anniversary during their annual International Congress (conference). Attended by thousands of professionals in the field of people beautification. A high tech (lasers, big screens, flying people) theatrical runway fashion show. Casey was hired by Antionette Beender, famous hair stylist from England, to entrap two of her "futuristic" models inside a giant tube of soap film - complete with spherical bubble helmets and giving off attitude to rival the gravitational pull of Mars. The space faring fems shattered the the encasing bubble wall to emerge in a beam of light and to stare unblinkingly at the odd life forms in the audience. Public Service Announcement for the Clark County Department of Air Quality and Environmental Management produced by Abe Froman Productions, Las Vegas NV, Casey consulted via telephone conference regarding a commercial in which the "hero" is a bubble traveling through shots promoting decisions that effect the quality of our air. Casey's input saved the production company time and effort, which we all know in the end is a cost savings. Innovative Kid of Norwalk, CT and publishers of "BubbleOlogy: A Hands-On Science Kit" approached Casey in 2002 to assist in the final development of this one-of-a-kind book/kit. They knew Casey could make the text they already had more exciting for kids. They harnessed not only his ability to engage children and teach them the art and fun of bubbling but received an added bonus with Casey's confident understanding of the science of bubbles, soap film and water. In the end 50% of the text in this 2004 Teachers' Choice Award winning book is based on the information Casey shared. That same year, "BubbleOlogy" was recognized by Southern Living Magazine as a top 10 "Smart Gift" for children. "We previewed his performance and knew we must bring Casey onboard to assist in adding fun and engaging activities plus insider secrets to our book. A pleasure to work with, Casey's extensive input helped us garner a 'Teacher's Choice Award' from Learning Magazine. Together we've created countless budding bubble-ologists nationwide." Consultant to the House the Mouse Built. In 2000 when Disney's Family Fun Magazine page needed an expert bubbler to check the facts and figures on their "Objects of Fun" page they contacted Casey Carle who helped them design some hands-on, backyard bubble fun for kids. Demonstrating once again that Casey is not adverse to releasing a trade secret or two to help kids of all ages succeed at bubbling. Bubble Consulting hits the airwaves! 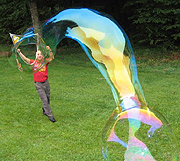 In the late 1990s, CBC Radio, Canada's national public radio broadcaster, received an email to their science desk asking why soap bubbles are always round no matter what shape wand is used to blow them. The producer contacted Casey Carle for an on-air interview with the host of the program. In an enlightening conversation regarding bubble geometry and physics, Casey shared expert advise and insights to satisfy the curious listener's effervescent inquiry. Waaaaaay back in the late 1980s Casey was a professional clown with the Ringling Brothers Barnum and Bailey Circus. There he explored a talent for developing top-notch forms of comedic entertainment. After less than a year of learning the ropes, Casey created and co-created comedic routines , four of which were chosen to be part of Ringling's next 2-year national tour; a rare achievement for a novice circus performer. One of these routines was a one-of-a-kind soap bubble act that earned him a "center ring" performance slot and a place in history as the first circus entertainer in the world ever to encase people in a bubble. The added bonus is that if Casey doesn't have the perfect answer he knows where to get it! Casey Carle is connected both professionally and personally to an international bunch of soap bubble enthusiasts. Add this to a 20 year career of live-show bubbling, a library of books, tons of online resources and you'll need to look far and wide for a more experienced soap bubble consultant. But it is more than knowledge and experience that makes Casey a top choice. He also brings a professional yet fun work ethic that is appreciated by the talent, directors, technicians and cinematographers he has had the pleasure to work along side of.